Call for Papers for the Nigeria Country Workshop of IWIM: "New Researches on Development in Nigeria"
Nigeria Country Workshop: "New Researches on Development in Nigeria"
Purpose: It is the purpose of the workshop to present new research results on development in Nigeria for three core issues (education and poverty; small industries and industrialisation; globalisation and development). 1. "Income Distribution, Education and Poverty in Nigeria"
2. "Networks, Clusters and Innovation in Nigerian Small and Medium Scale Industries"
3. "Applying a New Globalisation Index to Development Problems of Nigeria". The speakers will present full papers of their researches. Related researches by the speakers can be downloaded here. Participation of guests is welcomed upon application. Related researches can be presented by the guests in short statements. Guests can also become discussants of presented papers. Alexander von Humboldt Research Fellow Dr. Alabi leaves Bremen after 20 months of researches at IWIM on "Education, Inequality and Poverty in Nigeria"
Professor Dr. Reuben A. Alabi researches in Bremen on "Marginal Benefit Incidence Analysis of Public Spending on Health Services in Nigeria"
Professor Dr. Reuben A. Alabi from the Department of Agricultural Economics and Extension, Ambrose Alli University, Ekpoma, Edo State, Nigeria was awarded a returnee fellowship from the Alexander von Humboldt Foundation to do one year of research on “Marginal Benefit Incidence Analysis of Public Spending on Health Services in Nigeria”. This research will be done in close association with Professor Karl Wohlmuth from IWIM, Faculty of Economics, University of Bremen. Dr. Alabi has spent 18 months at IWIM to research on “Education, Poverty and Inequality in Nigeria” (see his most recent publications in the IWIM Blue Series Discussion Papers). Guest Researcher at IWIM: Dr. Reuben A .Alabi attended the Bremen Africa Conference 2010 in the Haus der Wissenschaft Bremen and then visited IWIM to discuss about new projects and researches with Professor Karl Wohlmuth. Dr. Alabi is preparing for further discussion papers for the IWIM Blue Series Discussion Papers (see his already published research papers on education, income distribution, and poverty in Nigeria as numbers 114 and 109 of the Series ). Also new projects, like the planned Conference for Researchers, NGO representatives and Policymakers on Education, Health and Poverty Alleviation in Nigeria to be held in Ekpoma, Nigeria in December 2010 and to be organized by the Alli Ambrose University, Ekpoma, Edo State, and supported by the Africa Initiative of the Alexander von Humboldt Foundation, were discussed. Research Output: Professor Dr. Alabi, Associate Professor in the Department of Agricultural Economics, Ambrose Alli University, Ekpoma, Nigeria and Alexander von Humboldt Research Fellow at the Institute for World Economics and International Management (IWIM), University of Bremen, has produced a new research paper on Progressivity of Education Spending in Nigeria, a study that is using complex new measurement tools (see the IWIM Blue Series Discussion Paper Number 119 to be downloaded as a PDF ). The study is based on a recent research visit at IWIM and the research was supervised by Professor Karl Wohlmuth. The study is intended to stimulate the ongoing discussion about new education and poverty alleviation policies in Nigeria. A further paper on Redistribution Policies and Education Spending in Nigeria is forthcoming quite soon as IWIM Blue Series Discussion Paper Number 120. Further related papers by Professor Dr. Alabi can be downloaded as well from the IWIM Blue Series Discussion Papers as the numbers 109 and 114 (IWIM Blue Series Discussion Papers). New Education and Health Policies for Nigeria: Professor Dr. Alabi has written a new research report on the redistributive effects of public education spending in Nigeria. With complex empirical methods the redistributive effect of public spending for education (for primary and secondary school attendance) is quantified (see IWIM Blue Series Discussion Paper number 120). This research report is part of a larger research project funded by the Alexander von Humboldt Foundation. The Foundation has financed over 18 months a research visit by Dr. Alabi to IWIM and is now funding a return fellowship over 12 months in Ekpoma, Nigeria at Ambrose Alli University. Professor Karl Wohlmuth is the supervisor of the project. Also other contributions to this project by the author can be downloaded (see numbers 109, 114, 119 of the IWIM Blue Series Discussion Papers ). Professor Alabi will visit IWIM in July 2010 to discuss the draft of the Interim Report to the Foundation with Professor Karl Wohlmuth. is again visiting Bremen in December 2010 to submit a research paper on the “Redistributive Impacts of Public Expenditures for the Health System in Nigeria”. The study was supervised by Professor Karl Wohlmuth and is financed by a fellowship from the Alexander von Humboldt Foundation. The Study will be published in the IWIM Blue Series Discussion Papers. Professor Alabi has as well studied the redistributive impacts of public expenditures for the education system in Nigeria (for other papers of the author see the list of IWIM Blue Series Discussion Papers). Research Output: Professor Reuben Adeolu Alabi, Department of Agricultural Economics, Ambrose Alli University, Ekpoma, Nigeria and Alexander von Humboldt Research Fellow at the Institute for World Economics and International Management, University of Bremen, Bremen, Germany has finalized a new research report on “Incidence of Public Health Expenditures in Nigeria”. It is published as Number 121 of the IWIM Blue Series Discussion Papers, January 2011. The research report was written with support of the Alexander von Humboldt Foundation under a returnee fellowship agreement with the theme “Public Health Spending, Income Distribution and Poverty in Nigeria” (link to IWIM Blue Series Discussion Paper Number 121, January 2011). Professor Karl Wohlmuth was the research supervisor. 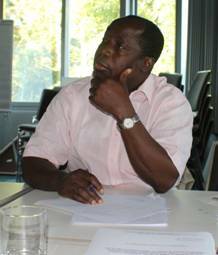 Professor Alabi has already finalized at IWIM in Bremen a major research programme on “Public Education Spending, Income Distribution and Poverty in Nigeria” that was also funded by the Alexander von Humboldt Foundation and supervised by Professor Karl Wohlmuth. Some of the research results were published in the IWIM Blue Series Discussion Papers with the numbers 109, 114, 119, and 120. He is also one of the editors of the African Development Perspectives Yearbook of the Research Group on African Development Perspectives Bremen. He recently started a new research programme on “Agro-industry Development in West Africa” in cooperation with Professor Hans Heinrich Bass, Bremen University of Applied Sciences.